my skin and i have been in a bit of fight for the past 18 months. i've always had acne-prone skin, but no breakout could have prepared me for my first full-blown cystic flare-up. i'm talking about having over a dozen cysts along my chin and jawline all at once. this became my "normal" for almost a year. constantly feeling frustrated, embarrassed, and anxious about my skin and how it looked. i was down to try ANYTHING that claimed it could help combat these breakouts. i kind of shudder thinking about all of the money i spent on products that didn't work. when a product wasn't working out for me i would just move on to the next one. last july, things sloooooowly started to turn around. it took a few months for me to fully build out a skincare routine that worked. it also took that amount of time for me to really start seeing a difference in my skin. for the past six months my breakouts have decreased significantly. there are the usual culprits: stress, that time of the month, and dairy. so yes, cystic breakouts are still very much so part of my life, but when they do pop up i only have to deal with just one or two monsters, not an entire jaw full of them. below you'll find a breakdown/schedule of all the products i currently use! i wash my face with this every morning. it's gentle, but will still remove all traces of grease without stripping your skin. it also has brightening ingredients which are a must when you're dealing with dark spots left behind from breakouts. bonus: it smells absolutely delightful. next up is toner. don't. skip. toner. i love this particular one because it's so refreshing on the skin and never stings. i pour some onto an exfoliating cotton round and gently swipe it across my face. this toner has a blend of active acids (salicylic, glycolic, and lactic) which work to gently exfoliate and clarify pores. you may remember this product from this post. all this time later and it's still one of my must-haves. if i'm dealing with a pesky breakout i'll use a q-tip to apply this product directly. i'm fairly certain i've tried every topical acne cream and gel out there and this is the only thing that can get the job done. this product absolutely helps to reduce inflammation and swelling! i give it just a minute to sink in before layering my serum over it. daytime serum! this product smells like a sweet citrus candy. vitamin C is the star ingredient here, working to brighten your complexion. it has a rather watery consistency, but that also means it glides onto the skin and absorbs really quick. this is my ultimate facial moisturizer combo. the dream team. if you missed it, i already raved about the fresh seaberry oil here. the ole henriksen moisturizer has a nice whipped texture that absorbs into the skin easily. both are fine on their own, but my skin looks its best when both of these products are combined. double cleansing my face at the end of the day has definitely made a huge difference in my skin. cleansing with an oil first breaks down and removes all makeup and dirt. when i follow up with my cleanser or scrub, i'm really washing and treating my skin. see full description above! use every other night. i aim to exfoliate 3 nights per week. this scrub has a slight warming sensation that feels incredible. glycolic and lactic acids work as chemical exfoliants, while volcanic sands physically exfoliate to purify pores and absorb oil. my skin feels so smooth and fresh after using this scrub, it practically drinks up any products i apply afterwards. see full description above! use every night. of all the products mentioned in this post, this one is my favorite. it does so much! it exfoliates, fights breakouts, lightens dark spots—seriously, this product works hard. this product has the longest name ever, but it's a good one. it's my sunday mask! i feel like this product is just a more intense version of the gel i use every night. after 20 minutes of wearing this mask my skin feels baby soft. if there's one word that's been repeated a lot in this post it's exfoliate. chemically exfoliate, physically exfoliate, there's a lot of exfoliating going on here. i use this mask 1-2 times per week to treat my skin and hydrate it. it has the most glorious warming effect when you apply it. i'll massage it into my skin for a good minute, and then i'll let it sit for another 20.
my skin used to freak out seasonally. i would spend weeks trying to get it under control, only for it to derail again when the weather started to turn warmer or cooler. over the past year i've discovered two products–one for the face, the other for the body–that have completely altered how i care for my skin. guys, this face oil is the ultimate skincare game changer. use it by itself or mix in a few drops with your AM/PM moisturizer. it absorbs into the skin beautifully, and if you wear makeup, your foundation will blend in like a dream. the scent? heavenly. to die for. please don't be afraid of this product if you have oily skin! oil + oil = happy, balanced skin. your face will not turn into a greasy slip-n-slide. trust me. i would also highly recommend this product if you deal with hyperpigmentation or acne scarring. there are plenty of things going on in my life that cause me to break out (diet! stress! ), and dealing with spots leftover from breakouts is the wooooooorst. i'm planning on doing a post about the products that have helped me get my cystic acne under control, but this oil really nourishes the skin and helps improve texture and scarring. the price is a little steep. however, i've been using the same bottle for over a year and i just purchased a back up. on the other end of the skincare spectrum, we have this drugstore moisturizer. is it glamorous? nope. but you know what's also not glamorous? dry and itchy skin. all over your body. i've had a tough time with body moisturizers in the past because there was always a gross film left behind on my skin. this one absorbs into the skin so easily. better than any moisturizer i've ever used before. i'll admit that i hate moisturizing during the winter. i do it after my shower when i'm already cold and just want to throw on some sweats and relax. ignore these instincts. spend 2 minutes moisturizing and your skin will be so soft. you can do it! this might be tmi, but... i have really mild psoriasis. it's usually a constant problem throughout the winter and i've barely had to deal with any flare-ups at all since i started using this product last fall. 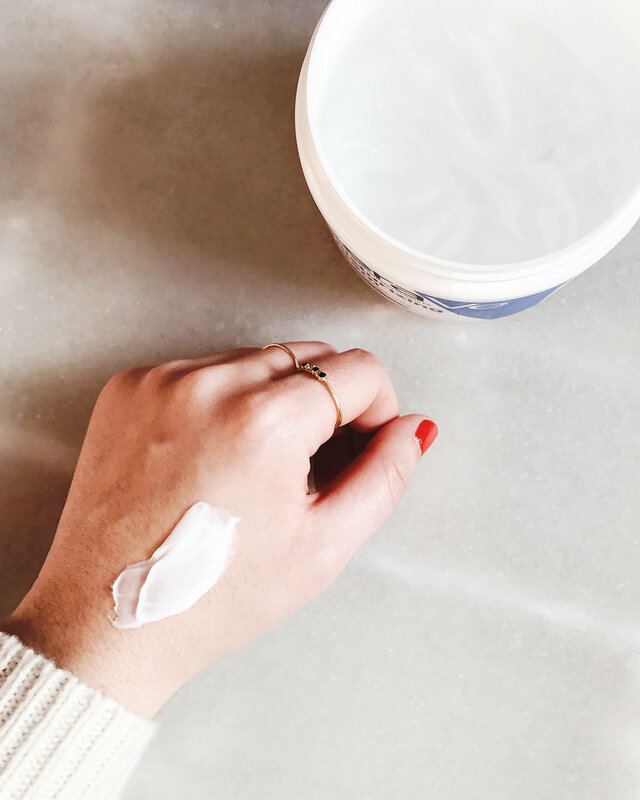 you can find this moisturizer at most drugstores for $12-$16. i go through a large jar each month and i plan on repurchasing it forever and ever.